Dom Di Paola’s Hornets will be assured of some raucous backing when they face Poole Town this Saturday in the third qualifying round of the Emirates FA Cup, courtesy of the club’s five youth squads. 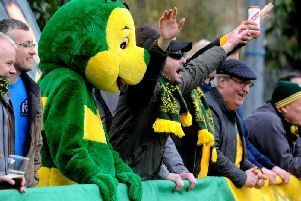 In a fabulous gesture, the club’s board of directors have agreed to put on a coach to transport the players from our u11s, u12s, u13s and u14s from Horsham to Culver Road to help add to that special cup tie atmosphere. Hornets Secretary Jeff Barrett said: "We want the youth team players to feel part of what is an important occasion for the club and believe that they can play their part in what promises to be an exciting afternoon." Youth Secretary Annie Raby was overjoyed at the decision, adding: “All the youth squads will be represented at the match, from U11 upwards and have filled the seventy-seven seater double decker. It is sure to be packed full of excitement on the day and there are also lads and parents travelling down by car to be a part of a massive day for the club. They are all looking forward to the occasion with everyone coming together as a club to show their support.